(CNN) -- Bloody attacks and midnight arrests, combined with a regime growing more technologically savvy, have begun stemming the flow of online information from dissidents in Iran, activists and human rights officials say. Once emboldened by their ability to dodge the government and spread news about their protests to the world, many in the youth-driven protest movement, they say, are now scared of the consequences of getting caught. "It's absolutely chilling," said Drewery Dyke, a member of human rights group Amnesty International's Iran team. "The level of fear that has permeated society now, in terms of this issue, is palpable. It's striking. "There's an absolute hunkering down by the people." Since June 12, when disputed election results sent tens of thousands of Iranians into the streets to protest, the world has gotten a front-row view of the unrest thanks largely to dissidents using online tools to spread the news. Iran's text-messaging network was restored this week, almost three weeks after it was disconnected, ILNA, the semi-official Iran Labor News Agency, reported Thursday. The service was cut a day before the election, the agency reported without giving a reason. Service was restored across almost all of the country on Monday, and in the capital, Tehran, two days later, the agency reported. But opposition supporters have been warning each other against using text messages, believing the government is monitoring them, according to many messages posted on Twitter. "Tell people not to use it for political info -- they are tracking," reads a much-quoted message from a Twitter feed using the name oxfordgirl. Oxfordgirl said Thursday cell phone service was again down in Iran. CNN could not confirm the authenticity of any of the posts on Twitter, the popular Web service that allows users to post short messages. The ability to send multimedia messages -- pictures or video -- by cell phone still has not been restored, ILNA said. "The information flow unquestionably has been severely restricted," Dyke said. "The clampdown has been multifaceted, including the technological means of jamming or cutting phone lines, of monitoring phone lines, and, of course, the more rough-edged side of arresting journalists and bloggers." 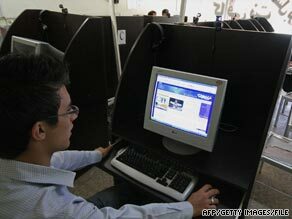 Users of social networking sites such as Twitter and Facebook have noted that once-active bloggers from Iran have gone quiet. Users in the West who have helped relay news from protesters in Iran say some of their most reliable sources have stopped posting over the past couple of weeks. "I've been doing a lot of work trying to sort out the news and find news sources because those sources are drying up as fast as we can get them," said Rob Nelson, a New York Internet technology specialist who has been using sites such as Twitter to help relay news from Iran. News from Internet users has been important in the wake of the election as Iran's government began kicking out some reporters from traditional media outlets, arresting others and restricting the movements of those who remained. As early as election day, supporters of reform candidate Mir Hossein Moussavi and others opposing President Mahmoud Ahmadinejad reported signals for their cell phones being jammed. After Ahmadinejad's disputed victory, networking Web sites in Iran have been blocked, and reports say phone lines have been disconnected or tapped and alleged government spies have infiltrated protester sites -- spreading misinformation or seeking the identities of those speaking against the regime. At first, members of the movement bragged about being able to skirt the Iranian firewall and share their message -- including pictures and videos that showed the scope of their protests and documented government and pro-government violence that helped galvanize international support for their cause. Now, some say, the government is catching up. "It's begun to tail off, but not because people aren't taking the video," Nelson said. "There's just no way to get it out. "Even the really savvy ones, they're having a hard time getting around things just because everything that they've been using is getting blocked quickly." At least as effective as the online fight has been the violent, real-world targeting of dissidents using the Internet. Iranian bloggers have been arrested and others beaten by loyalist Basij militia members, Dyke said. Some formerly reliable sources in Iran now refuse to speak freely on the telephone or ask Amnesty International staffers to stop calling them, Dyke said. "It hits you in the face; it's extremely frustrating," he said. "They appear to have drawn up the bridges -- hopefully those bridges will come back down soon." Roya Hakakian, an Iranian-American author and journalist who has stayed in contact with friends and others in Iran, said she heard about one woman being stormed by pro-government militia members for merely stepping out of her car and using her cell phone during a traffic jam near a protest. Hakakian said she fears not just the clampdown on information now but what may come next. "Why are they so insistent on making sure there is no communication?" she said, comparing the move to when a fundamentalist government fresh off its overthrow of the Shah of Iran went on a brutal campaign to silence its critics. "They want to go back to what they have done in the early '80s -- do away with a large number of the opposition that refuses to be converted and refuses to give in." While the crackdown has clearly had an effect, Hakakian -- a native of Tehran who came to the United States in 1985 and now lives in Connecticut -- said she is hearing another, more hopeful, reason for at least some of the growing Internet silence from Iran. She said the anti-Ahmadinejad movement was set up as a political campaign, not a revolutionary effort. As its mission has changed, leaders are stepping back from their early tactics and quietly charting their next move, she said. "I'm not sure how much of it we can attribute to an actual cutoff of the communication and how much of it has to do with the opposition trying to reorganize and restrategize," she said. "They are cracking down, but the opposition is also figuring out what to do next." CNN's Richard Greene and Shirzad Bozorgmehr contributed to this report.